Serving others means doing acts of care and compassion to help alleviate suffering and make the world a bit more like the Kingdom of God that Jesus proclaimed was breaking into the world. Jesus commanded his followers to love one another. Decreasing a person’s misery is a way of loving them. So we advocate for systemic changes in our society as well as offer direct, concrete help to those in need. This work is considered so important that we have a standing committee of Session, the Outreach and Mission Committee, that is dedicated to overseeing our efforts at serving others. These efforts are local, national and global. For fifty years the FOCUS ministry has proven that there are several ministries that churches can do better together than alone. The FOCUS ministry is a consortium of several churches of varying denominations that have partnered in a unique act of solidarity to run a food pantry, a feeding program and several other programs. We also worship together four times a year, demonstrating that what unites us is stronger than what divides us. Sunday, February 5, was one of those Sundays. Kicking off FOCUS’ 50th Birthday Celebration, the Rev. Rick Spalding offered a powerful witness to the ministry of FOCUS—listen here. The Rev. Spalding challenged the FOCUS churches to continue to live into our calling to do together what we cannot do alone—respond to our neighbor’s needs in the city of Albany and beyond, as God’s servant people in a broken and hurting world. 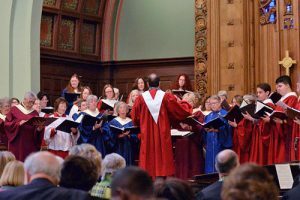 Choirs came together from the six churches to form a 60-voice choir—listen here. Located at Westminster Pres, 262 State Street in Albany, it is open Tuesday through Thursdays from 7 to 9 am, October through April. A simplified version of the program, Breakfast Express, operates from April to October, on Tuesdays and Wednesdays from 7:30 to 8:30, offering a cold breakfast buffet. Volunteers are needed each morning to set up, cook a hot meal (October through April), serve, clean-up, or assemble lunches that our guests take with them. The FOCUS pantry offers an appropriately generous 6-day supply of groceries each month, along with some toiletries and other necessities. Guests of the pantry can also find friendship, spiritual advice and other resources. The pantry is housed at Emmanuel Baptist Church, 275 State Street in Albany. It is open Monday through Friday from 10 am to 1 pm, as well as the last Saturday of the month, same hours. Volunteers are needed to stock shelves, register families and help them select their groceries and bag them. Other FOCUS ministries include: School Supply Drive, Albany Community Harvest Garden, Gardening in Bucket and various advocacy initiatives. The closest Albany city school to First Pres happens to be named for a Presbyterian pastor, and it also has many opportunities for our church members and friends to put their education to work. We formed a partnership in 2012, telling the school that we want to help them succeed at their goal of teaching the children in their care. Giffen is located in a lower-income area in South Albany. The student population is primarily African-American and immigrant. Among the first partner activities have been tutoring and assembling new playground equipment. Currently about 20 tutors are working with the students during the school day. A highlight of each year in our partnership is Author and Illustrator Day. Held in the spring, First Pres helps find children’s book authors and illustrators to come to the school and offer a presentation on their work and how they do it. Preceding the day, books by the invited authors and illustrators are made available to the Giffen classes, so the children are familiar with the books. The classes often create art projects inspired by the books. First Pres also helps each child leave with at least one free book for reading at home. Recent authors and illustrators include: Katherine Paterson, Jerry Pinkney, Nina Crews, Pat Cummings, Renee Watson, Alexis O’Neill, Lesa Cline-Ransome, James Ransome, Sandra and Miles Pinkney, Joseph Bruhac, James Preller, Rose Kent, Elizabeth Zunon, Matthew McElligott, Bruce Hiscock, Dan Mahoney and Coleen Murtagh Paratore. Another partnership connection is the First Pres quilters who make children’s quilts and blankets that are given as a “graduation gift” to those parents who complete a 9-week Baby Institute course on parenting, taught at the school. First Pres plays a key leadership role in this tutoring program of the South End Neighborhood Tutors. Wizard’s Wardrobe is located in Albany’s South End at the corner of Rensselaer and Church streets in the back of the first floor of the tower. It is about one block from Giffen School. If you can read and write, you can be a tutor! To love someone is to be his or her advocate. First Pres does a variety of advocacy activities as we work to reduce the widening gap between rich and poor in our area. Our proximity to the State Capitol provides us with a unique opportunity to speak truth in the halls of power, to advocate for those in need and encourage our elected officials to act responsibly. 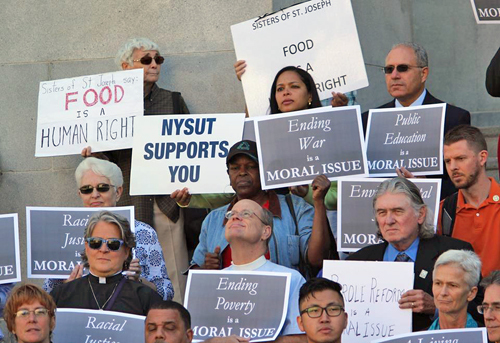 Often in consort with our friends in the FOCUS ministry, members have attended rallies there to advocate raising the minimum wage, increasing state funding for hunger programs, supporting marriage equality, passage of GENDA, and for speaking out for victims of racially based violence. Our members are also encouraged to send postcards to their elected officials on various topics. We also have a “float” in the local Pride Parade, since we want our society to be as inclusive as we are. 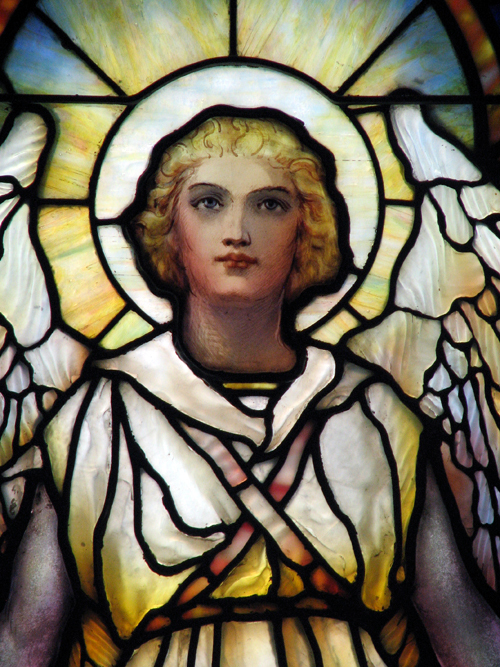 In response to the recent threat to ban transgender Americans from military service, we, the Session of First Presbyterian Church, Albany, NY, stand in solidarity with our transgender sisters and brothers and with all people, regardless of sexual identity or orientation, in denouncing discrimination in all its forms and regardless of its source. No person is a “burden” or a “distraction.” Each is a beloved child of God and a sister or brother to each of us. We especially call on those in powerful office or positions of authority to carefully consider the full impact of their pronouncements in advance of issuing them. 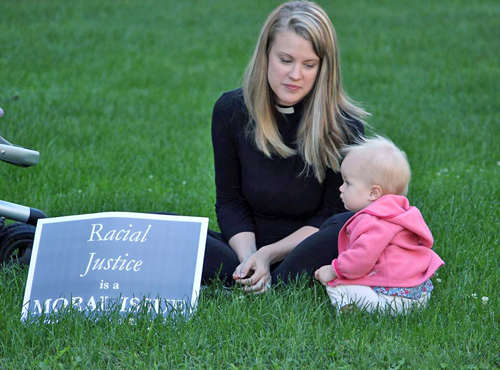 As Christians, we, the Session of First Presbyterian Church, Albany, NY, are committed to stand with all who are oppressed, marginalized, victimized, or persecuted and to do all in our power to protect and defend. We boldly assert that God’s creation is universal and is a reflection of God’s own self, those of every race, color, ethnicity, of every gender, sexual orientation or sexual identity, speaking every language and born in every place, following every religious tradition. Everyone of these is created in God’s own image and rejection of any is a rejection of God. We especially invite those in positions of leadership and power to restrain any injustice and to avoid at all costs any pandering or use of prejudice for political gain. We seek a world as God envisions, a world of justice, mercy, and love. The Home Repair Project will begin its 4th season this year. Back in 2014, First Pres hosted a Group Cares Work Camp, a national organization for youth ministry that sponsors week long work camps. 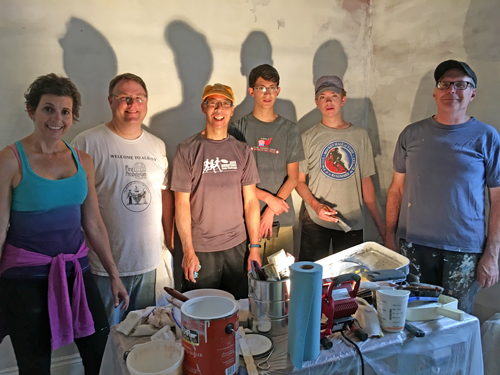 During this week 426 youth, from churches all over the country, provided the labor for home owners unable, for a variety of reasons (age, health, financial, disability), to maintain their homes. Many homes were repaired, but after the work camp ended, there were still applications remaining. Thus, our Home Repair Ministry was born. Home Repair Work Days occur in the spring, summer, and fall, utilizing volunteers with varying levels of skill. Workdays are usually held on Saturdays. Contact Christy D’Ambrosio to volunteer. Commonly referred to as “T-Day,” First Pres has been a meal site for over forty years for this traditional meal, open to all who are hungry. The meal is organized in partnership with Equinox, an Albany-based non-profit service organization that is dedicated to providing holistic and compassionate social services to individuals and families, including residential programs for homeless youth and victims of domestic violence. While many volunteers are out delivering meals to homes, over 300 people enjoy good food and a shared meal in our Assembly Hall. It takes the work of many volunteers leading up to the dinner, on Thanksgiving Day itself, as well as cleaning up the building the day after the meal. First Pres supports The Overflow Shelter with funding but also with meals. For the last several years, First Pres has signed on to provide meals to feed 20 people on Mondays from November through April. The host of this homeless shelter is First Lutheran Church, 181 Western Avenue in Albany. All that is needed to participate in this ministry is to sign up for a meal date, prepare a simple meal and deliver it to the shelter. Families, Small Groups, Committees and individuals have found that making a meal possible is a rewarding ministry. Each May, First Pres members and friends enthusiastically support the local CROP Walk that raises money for hunger programs by gathering sponsors and walking, or by sponsoring other walkers. The money raised is divided between local food pantries (25%) and Church World Service (75%) which ships food and supplies to over 80 countries around the world. Locally the walk is organized by the Capital Area Council of Churches. Walkers can choose either a 4.5 mile loop with rest stops along the way or a “Golden Mile” loop for those who feel they cannot walk that far. The Albany walk often ranks in the nation’s top ten CROP walks in funds raised, and First Pres has been awarded for top five finishes among organizations enrolled in Albany’s CROP walk. We often gather for lunch at the starting point, First Lutheran Church, 181 Western Avenue in Albany, just before the walk begins. First Pres helped found the Capital Region Theological Center (CRTC) and continues to support it with board members, financial support and class attendees. The center is a local source for theological, biblical, and organizational support for churches as well as those who want to learn more about their faith. As a member of the Presbyterian Church (USA), First Pres is also a part of Albany Presbytery, the regional body of churches in our area. The Presbytery supports the churches in its jurisdiction—each of which is doing mission in its community. It also specifically funds Troy Area United Ministries, Schenectady Inner City Mission, and college campus ministries. Through our mission giving to the Presbyterian Church (USA), First Pres has a hand in countless acts of compassion and care across the country. First Pres also participates in four of our denomination’s national offerings. These include The Peacemaking and Global Witness Offering, The Christmas Joy Offering, The One Great Hour of Sharing and The Pentecost Offering. This offering supports the efforts of the Presbyterian Church (USA) to live out a deeper commitment to peacemaking as part of our faithfulness to God. To bring peace to our neighbor is to love our neighbor. Of the collected offering, 25% is kept at First Pres to further its own peacemaking endeavors with the remainder used nationally by our denomination. The offering enables the church to promote the peace of Christ by addressing systems of injustice across the world. Presbyteries and congregations all over the nation are using their share of the offering to do literally hundreds of programs to increase peace. 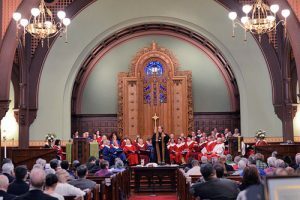 First Pres has used its share of the offering to help people who come to the church with extraordinary needs, for peace-themed adult education, to help agencies doing peace work in the Capital District, for home repair work in Albany, for advocacy work, for hunger programs and more. This offering supports retired missionaries and church leaders as well as Presbyterian Racial/Ethnic Schools. At First Pres this offering is received in worship on the fourth Sunday in Advent. At Christmas, God gave the Christ child to the world. In gratitude we also give to help those who have served our church around the world. This offering is promoted in Lent and received in worship on Easter. This offering supports three vital mission programs. 36% goes to the Presbyterian Hunger Fund which supports anti-hunger initiatives around the world. This includes not only seeds for planting but the know-how for people to grow food for themselves, anti-obesity education and more. Presbyterian Disaster Assistance receives 32% of the offering. “PDA” uses its funding to help alleviate the suffering of victims of disasters like hurricanes, earthquakes, tsunamis, and flooding around the world. And that includes here in New York. In 2014, PDA funds came to help those in Schoharie County here in our Presbytery. The Self Development of People receives the remaining 32%. “SDOP” encourages groups of people “who have come together to work to escape poverty, seek justice for their community or want to change systems that perpetuate oppression” by offering micro-grants from our national denomination or local presbytery. A Village, Inc., an Albany non-profit, received funds from Presbyterian SDOP for 2015. Pentecost is the birthday of the church, the day the Holy Spirit empowered it to grow and spread around the world. The children and youth of our church and our society are starting out in life and many need our support. What better day to receive an offering meant to help children and youth successfully launch into their lives? The Pentecost Offering benefits programs for children-at- risk, youth and young adults. 60% of the offering is used nationally for leadership development programs for young adults; to sponsor the Youth Triennium event for spiritual growth; to support the Young Adult Volunteer program (a one year service opportunity for young adults aged 19 to 30 wherein they live in intentional Christian community sites across the U.S. and around the world) and more. Our congregation retains 40% of this offering for its on-going outreach and mission with young people, like tutoring and youth mission trips. This offering invests in our future! First Pres is called by God to reduce the widening gap between rich and poor. 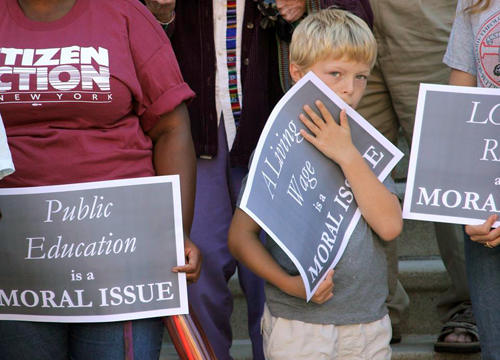 A recent decision by the U.S. Supreme Court has accelerated the widening of the gap. 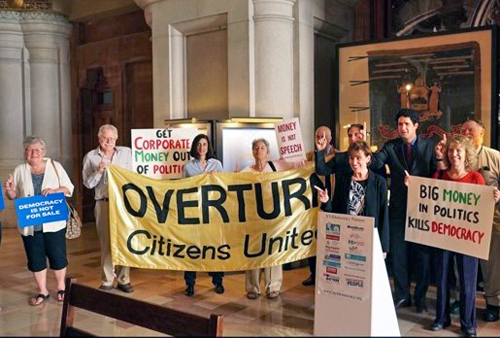 First Pres members have taken part in efforts to overturn what is known as the Citizens United decision. Central to the efforts to overturn this is the belief that a constitutional amendment is needed that will once again put limits on campaign contributions and reduce the outsized influence of mega-large corporations and extremely wealthy individuals. When money talks in the political realm, democracy is often silenced. The desires of the wealthy get attention and the needs of the poor are ignored, including any action to slow the widening gap. First Pres members have helped take the first step in this process, by helping convince the New York State legislature to go on record as being in favor of just such an amendment. First Pres has been a site for purchasing Fair Trade goods for several years. 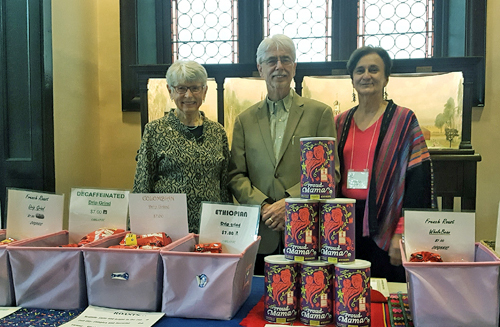 Visit First Pres on the second Sunday of the month and you will find in Assembly Hall a variety of coffees, teas, chocolates and other products created by needy producers from around the world. Purchasing Fair Trade Products allows workers to receive fair wages for their labor, allowing them to live with dignity and often provides money for the education of their children. Your purchases help change the world. Learn more by viewing a video about Equal Exchange products. 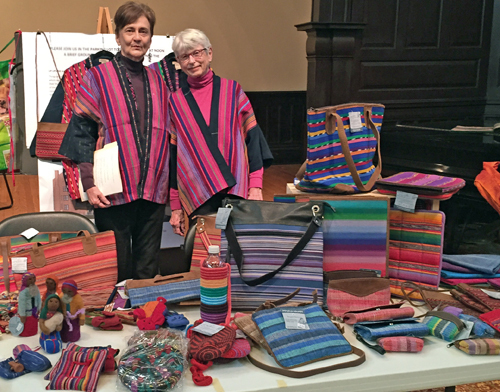 During December, First Pres hosts a sale of hand woven items and products created by small groups of weavers from the Western Highlands of Guatemala. The women weavers meet together to weave and offer support to one another. Many of the weavers come from very difficult circumstances, so being part of a cooperative sustains them in many ways. They are paid fairly for their work before it is sold. This enables the women to better their lives and educate their children. Mayan Hands is a Fair Trade and 501 (c) 3 non-profit organization. Learn more about Mayan Hands. This stands for Sales Exchange for Refugee Rehabilitation and Vocation, but since the mission of the organization has expanded greatly since its inception, we now use SERRV as a word on its own. SERRV is a non-profit organization with a mission to eradicate poverty wherever it resides by providing opportunity and support to artisans and farmers worldwide. SERRV supports women’s rights, teaches new skills, guides sustainable development and pays fair wages. We at First Pres support these ideas, not just in words but in actions by supporting the artisans and farmers that depend on SERRV. Each fall we provide the congregation with the opportunity to buy Fair Trade products from around the world with a SERRV catalog sale. The catalogs are available for several weeks for orders to be collected, then the whole order is placed in time for the items to arrive well before Christmas. Albany Presbytery has been in a partnership with Mam Presbytery in Guatemala for many years. We are creating a true partnership, where mutually beneficial friendships, church relationships and a two-way flow of ideas and prayers is central. First Pres has been very active over the years in supporting the partnership. Many members have visited our sister presbytery. Mam Presbytery (Presbiterio) is comprised of mostly Guatemalans who speak Mam, a native dialect. Wagemark is an international organization that gives a public “stamp of approval” to businesses, non-profits and municipalities that practice common sense and sustainability in the rate at which they compensate their top management. Overall, compensation given today to top executives has gotten out of control, leaving less for lower level employees. In larger corporations, this compensation is obscene given the growing gap between rich and poor today. Wagemark recognizes those businesses and other organizations that are offering an 8 to 1 ratio (or better) in their compensation. To be Wagemark Certified, the top management cannot receive more than 8 times the rate paid to the lowest 10% of employees. First Pres liked this idea of a kind of “Good Housekeeping Seal” for wages. Our first step before commending being Wagemark Certified to others was, obviously, to be certified ourselves. We came out at around a 4 to 1 ratio. Learn more about getting your own place of work Wagemark Certified. And spread the word! The Board of Deacons is a group of members called and dedicated to a ministry of hospitality and caring, modeled on Jesus’ compassion and the early church in Acts, chapters 6 and 7. What do the deacons do? We listen. We care. We do our best to stay in touch with our flocks (see below), celebrating joys as well as providing support in distressing times. Deacons minister to those in need: to the sick, lonely, or in need of comfort for any reason. Our aim is one of sympathy, witness, and service after the example of Jesus Christ, to demonstrate the Christian role of compassion within a congregation. Our membership is divided into “flocks” that we Deacons “shepherd.” A flock is created by geographical residence so that its members can take care of each other as well being led by its Deacon. We maintain contact through email, cards, phone calls and home visits. We also visit those in the hospital, rehab and more advanced care facilities, as well as the home bound. Assist in preparation and distribution of the elements for communion. Assist with receptions following funeral memorial services. Host the coffee hour following worship services to encourage fellowship. Oversee the flower ministry including distributing them after services to those mentioned in need of prayer. Host flock gatherings from time to time to celebrate fellowship. A Deacon’s term of service is for 3 years. You do not have to be a Deacon to participate in congregational care, if that is one of your gifts. Let your Deacon know you would like to help—perhaps you would like to be a Deacon one day.